Lead perforation is the most feared complication after transvenous permanent pacemaker implantation. Lead perforation can occur during or after the procedure and can easily be diagnosed by electrocardiogram (ECG), fluoroscopy, and echocardiography. Usually, a left bundle branch block (LBBB) pattern in surface ECG recording is observed after a right ventricular (RV) endocardial pacing. The presence of a right bundle branch block (RBBB) pattern raises the suspicion of lead perforation. However, it can be a normal finding in RV apical pacing. Here, we are reporting a case of RBBB pattern in ECG after RV endocardial permanent pacemaker implantation, suggesting lead perforation. 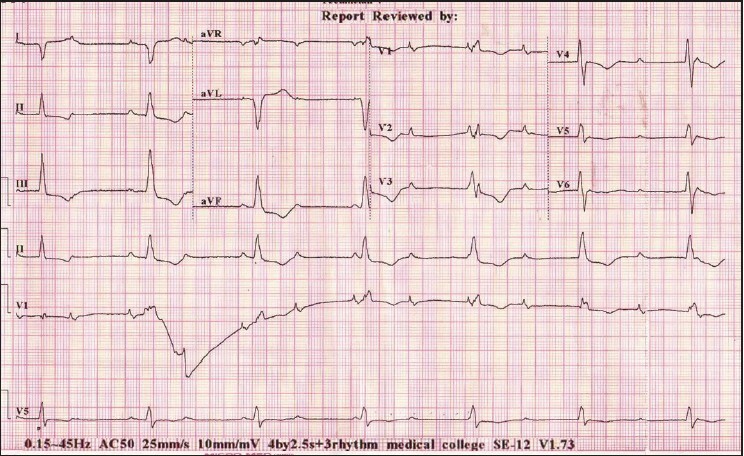 A 71-year-old woman presented with history of recurrent syncope for the last 6 months. She had no history of chest pain, palpitation, breathlessness, diabetes, or hypertension. She was not on any drugs. Clinical examination revealed a regular pulse with a rate of 38/min. Jugular venous pulsation showed intermittent cannon waves. 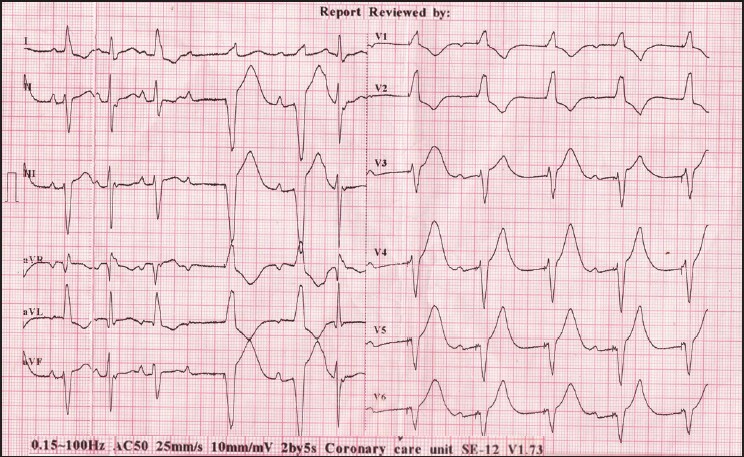 The initial ECG showed complete heart block with a complete RBBB pattern and an escape rhythm at a rate of 39/min [Figure 1]. All other routine laboratory investigations including thyroid function test were normal. A transvenous VVI permanent pacemaker (Talos S, Biotronik, Germany) using a bipolar lead was implanted through right subclavian vein without any complications. The stimulation threshold was 0.6 V at 0.4 ms, R-wave amplitude 15.0 mV and the impedance 760 ohms. The postoperative course was uneventful. However, repeat ECG showed an unusual RBBB pattern with a frontal axis around −75° during ventricular pacing [Figure 2]. 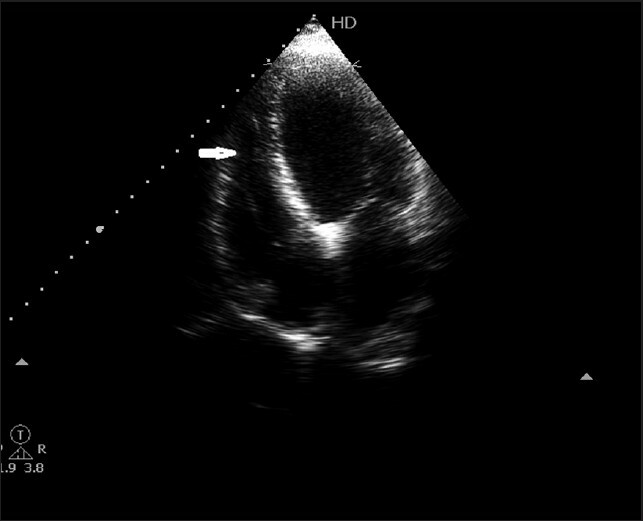 Chest roentgenographic [Figure 3] and fluoroscopic studies revealed no RV free wall or septal perforation, and the echocardiogram clearly showed the pacing lead going from the right atrium to the right ventricle and lying in the RV apex [Figure 4]. The patient is on follow-up for 9 months without any adverse cardiac events. Commonly, RV pacing yields LBBB configuration and left ventricular (LV) pacing yield RBBB configuration. QRS complex may change from LBBB to RBBB in cases of perforation of the RV-free wall or of the interventricular septum by the pacing lead. Other common causes of RBBB pattern after pace maker implantation include pacing lead in the coronary sinus and LV pacing. Rarely, however, the RBBB patterns may occur in RV pacing despite correct placement of the pacing lead. Patients with RBBB configurations after transvenous RV pacing require careful evaluation to differentiate between cases of correct lead placement and those of malplacement or myocardial perforation. Safe uncomplicated RBBB pattern may be seen with correctly positioned RV leads in the distal septum or apex. In our patient, the lead was positioned near to RV apex, which was confirmed by investigations. Therefore, so in case of RBBB pattern in ECG, after transvenous pacing, this normal variant should always be considered before considering complication. Simple investigations like chest X-ray, fluoroscopy, and echocardiography are useful in confirming this diagnosis. 1. Ormond RS, Rubenfire M, Ambe DT, Drake EH. 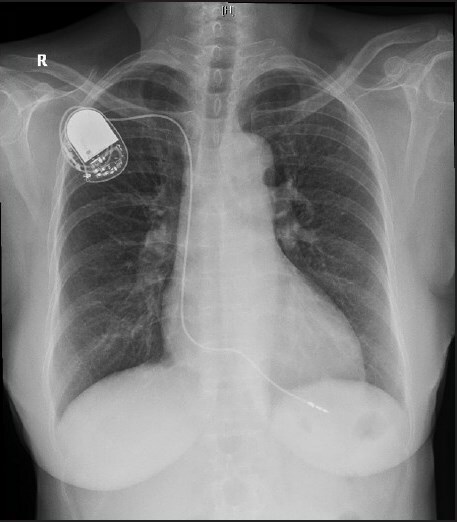 Radiographic demonstration of myocardial penetration by permanent endocardial pacemakers. Radiology 1971;98;35-7. 2. Yang YN, Yin WH, Young MS. Safe right bundle branch block pattern during permanent right ventricular pacing. J Electrocardiol 2003;36:67-71. 3. Mower MM, Aranaga CE, Tabatznik B. Unusual patterns of conduction produced bypacemaker stimuli. Am Heart J 1967;74:24-8. 4. Barold SS, Narula OS, Javier RP, Linhart JW, Lister JW, Samet P. Significance of right bundle-branchblock patterns during pervenous ventricular pacing. Br Heart J 1969;31:285-90. 5. Masahiro O, Kazuhiko, Takehiko N, Yoshinobu O, Yoshizumi K, Masayuki T et al. Right bundle branch block like pattern recorded in right ventricular endocardial pacing. J Arrhythmia 2005;21.